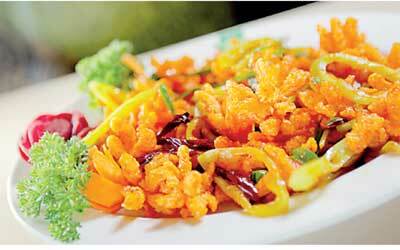 JADE Restaurants announced a range of promotional offers for its dine-in customers during the festive season. JADE is part of LAUGFS Restaurants Ltd. and operates a chain of family restaurants offering authentic Chinese cuisine. The promotions include a 30% discount for Commercial Bank credit cardholders for dining in at any of JADE Restaurants. The offer is valid till 17 April and can be enjoyed for all food and beverages in the menu. The ‘LAUGFS Labendiyawa’ cardholders are also offered a 10% discount for dining in during this season, as an extension of its year-long special discount offers. Celebrating 10 years of serving delicious Chinese food, JADE has become renowned over the years as a popular restaurant to enjoy authentic cuisine with family and friends. With a seating capacity of 80 to 100 pax, its unique ambience and warm service makes it a perfect choice for dining in a relaxed setting. It also offers takeaway and home delivery within specified areas for the convenience of customers. “We are pleased to offer a number of promotions during this Avurudu Season to reward our customers to enjoy authentic cuisine,” remarked LAUGFS Restaurant Deputy General Manager Nimal Wijesinghe. “Within a short span of time the restaurants have become very popular to dine in with friends and families. We are constantly focused on not just offering great authentic food but also on providing exceptional service for both our dine-in and take-away customers. These have been the key reasons for JADE becoming a popular choice for Chinese cuisine within a very short period of time. It’s very encouraging and we plan to further expand our chain to serve many more customers,” he further elaborated. Launched in 2006, JADE has expanded its restaurant chain in the Colombo suburbs, focusing on highly residential areas such as Nugegoda and Maharagama in the outskirts of the city. It has been known for its partnership with LAUGFS Supermarkets, being usually located together, while also sharing promotional offers with its loyal customers through ‘LAUGFS Labendiyawa’, a unique insurance policy offered for shoppers at LAUGFS Supermarkets. JADE Restaurants serve delectable cuisine prepared by highly trained chefs using original Chinese recipes and ingredients handpicked by expert chefs to provide that authentic Chinese flavour. Open every day for lunch from 11:30 a.m. to 3 p.m. and dinner from 6:30 p.m. to 10 p.m., JADE also offers takeaway as well as home delivery within specified areas with order placement provided through its dedicated hotline. Together with a quiet and friendly setting for dining in, it further offers special facilities for private functions such as birthdays and anniversaries.